John Owen Dominis (March 10, 1832 – August 27, 1891) was an American-born statesman. He became Prince Consort of the Kingdom of Hawaiʻi upon his marriage to the last reigning monarch, Queen Liliʻuokalani. Dominis, along with his brother-in-law King Kalakaua, established the Ancient & Accepted Scottish of Freemasonry in the Hawaiian Islands. John Owen Dominis was the first Freemason in the Kingdom of Hawaii to receive the 33° of Freemasonry and also served as the first Venerable Master of the Lodge of Perfection. His father was an Italian sea captain named John Dominis (born Giovanni Dominis, 1796–1846) who came to America in 1819 from Trieste during the Napoleonic Wars. He was a descendant of the Venetian noble family of Conti Palatini de Dominis de Arba, that had its origins in the island of Rab in Croatia. His mother was Mary Jones, an American of English descent. Working for Josiah Marshall of Boston, Massachusetts, Captain Dominis sailed from North America across the Pacific, often stopping in Hawaii. One of his ships used on the trading voyages was called “Owhyhee” (an older transcription of ‘O Hawai’i). The captain married Mary Lambert Jones (1803–1889), daughter of Owen Jones and Elizabeth Lambert, on October 9, 1821, and had two daughters, Mary Elizabeth (1825–1838) and Frances Ann Dominis (1829–1842). About 1831, they moved to Schenectady, New York, and son John Owen Dominis was born on March 10, 1832. In 1837 the captain moved his wife and son from New York to Honolulu, Hawaii. King Kamehameha III awarded land to the family in 1842 as settlement of a lawsuit with the British Consul Richard Charlton. The captain continued to take voyages to raise money for the construction of a large house. In 1846 he sailed for China on the Brig William Neilson, intending to purchase Chinese-made furniture for the house which was nearing completion. The ship was lost at sea, along with the American Agent George Brown, and Mary became a widow. Mary rented a suite of rooms to support herself and young John Owen. One of the first boarders established the American Legation in the house and named it “Washington Place”, which was used as a governor’s residence and is now a museum. He attended a day school run by Mr. and Mrs. Johnston that was next to the Royal School founded for the children of the native Hawaiian nobility. Dominis would climb the fence to look at the princes and princesses, and became friends with them. For a time, Dominis was a mercantile clerk in San Francisco, and later he served as a clerk in a Honolulu commercial house. By 1856 he was on staff to a Prince, and accompanying the royal family on their travels. On September 16, 1862 Dominis married Lydia Kamakaʻeha Pākī, later Queen Liliʻuokalani, whom he had met during school days. They had been engaged for two years, but had to delay their wedding due to the death of Prince Albert, the young son of King Kamehameha IV. His marriage to Liliʻuokalani and his friendship with King Kamehameha V brought him many honors. For example, he was a Royal Commander of the Royal Order of Kamehameha, the Royal Order of Kalākaua, and several others. From 1863 he served on the King’s Privy Council. Dominis served from 1864 to 1886 in the House of Nobles, and from 1868 until his death as Royal Governor of Oʻahu. He served on the Board of Health, Board of Education, Bureau of Immigration, and was Quartermaster General and Commissioner of Crown Lands. From 1878 to 1886 he served as Royal Governor of Maui. 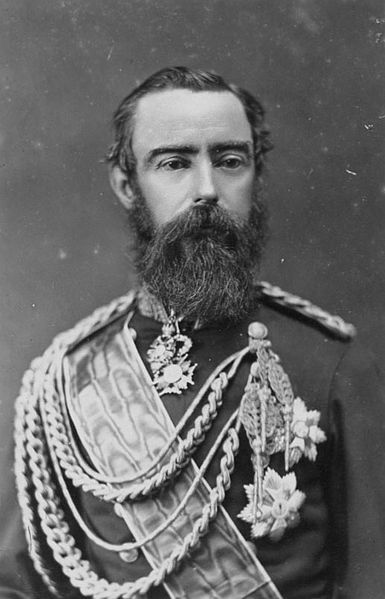 In 1886, he was appointed Lieutenant General and Commander in Chief. Mary Dominis died on April 25, 1889, and he and Liliʻuokalani inherited Washington Place. Liliʻuokalani became Queen when her brother King Kalākaua died on January 20, 1891, which made Dominis Prince Consort. Dominis died less than a year later on August 27, 1891, in Washington Place and was buried in the Royal Mausoleum known as Mauna Ala.